Fortress Of Freedom Board :: View topic - George Stroumboulopoulos - Man On The Move! Posted: Tue Aug 17, 2010 8:13 pm Post subject: George Stroumboulopoulos - Man On The Move! George Stroumboulopoulos (left) and Shane Murphy in Toronto! 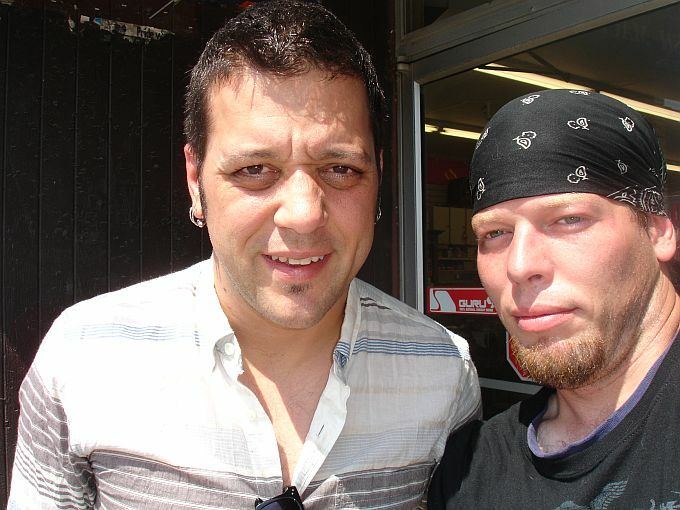 I ran into an old aquaintence of mine on August 11, 2010, none other than George Stroumboulopoulos! George is the host of a CBC television show called "The Hour" which interviews newsmakers and artists and his radio show on CBC Radio 2 called "The Strombo Show." We hung around for a few minutes talking about old times, and I told him about my music and involvement with FOF. He seemed very interested in us, but more interestng is George's rise up the broadcasting ladder. Mr. Stroumboulopoulos became recognized in Toronto when he worked for "The Fan 590" which is a sports radio station and moved to "102.1 The Edge" hosting "Live In Toronto" (a radio station which we have an on-going advertising contract). 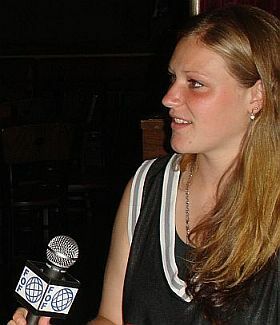 From there he moved to "MuchMusic" where he produced and hosted "The NewMusic," "LOUD", "The Punk Show" and "MuchNews". From MuchMusic George moved to the CBC and eventually ended up hosting "The Hour." This is his sixth season with "the Hour" and they have won eight Geminis along the way. George is still in radio with "The Strombo Show." "George was just the sweetest guy! He would come out onto the street during breaks, always talking to all of use and sometimes buying us coffee and donuts. He is just one of the nicest guys I ever met!" Now a man in his fourties, George Stroumboulopoulos nevertheless can straddle the gap between his music connections and dignified politicians he regularily interviews, the result of his over 18 years in broadcasting. One of the most relevant journalists in Canada, I can only see further success for George in the Canadian Braodcasting Industry! Catch George Stroumboulopoulos's show "The Hour" on CBC at 11:00PM Monday to Friday!